For many Christian laymen, the word “epistemology” is like a cavernous dungeon filled with dragons. Dramatic? Yes, but also an accurate description. 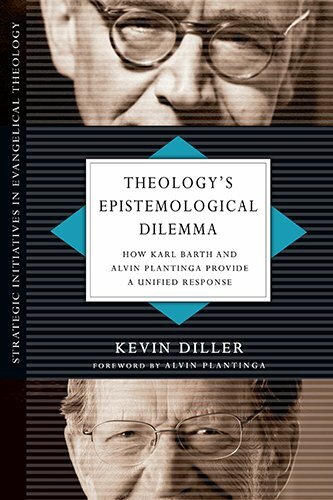 In Theology’s Epistemological Dilemma: How Karl Barth and Alvin Plantinga Provide A Unified Response (henceforth, TED) author Kevin Diller brings to life an intricate response from two of the great modern minds in the Reformed tradition. Against the backdrop of the enlightenment’s modernism and the postmodern-relativisms of the day, Diller provides the church, theologians, and philosophers with a wide and deep framework for understanding revelation, faith, reason, and apologetics. Early on in TED, Diller does the heavy lifting of presenting the epistemic problem derived from the enlightenment and skepticism (chapter 1), Barth’s doctrine of revelation (chapter 2) and engagement with philosophy (chapter 3), as well as Plantinga’s “Christian philosophizing” (chapter 4) and “warrant of revelation” (chapter 5). For conservatives and evangelicals unfamiliar with Barth or Plantinga these chapters are essential reading and some of the most difficult in the book. It is recommended that readers unfamiliar with these men read the “Summarized Interlude” (chapter 6) before diving into the intricacies of the two men. Working to explain a “properly high view of theological knowledge and yet a low view of the independent capacities of human theologians” (42), Diller’s distillation of Barth’s theology and Plantinga’s philosophy is outstanding. Along those lines, Diller frequently clarifies and clears up misconceptions of the two men, their teaching, and the subsequent consequences of their thought. The most important of these points is Barth and Plantinga’s agreement that any knowledge of God is a “real gift” that “cannot be grasped from below but only received from above” (169). Plantinga coined the phrase “Reformed Epistemology.” Barth simply sees this as an extension of the Reformed sola gratis. In both cases, knowledge of God is highly valued as God Himself provides the assurance of warrant and belief. In both cases man cannot ascent through natural means to this knowledge of God (refuting modernism and relativism). In understanding this, Barth’s view on Natural Theology (chapter 7) can be cleanly delineated and understood in relation to Plantinga (179-191). This also helps explain Barth’s rejection of apologetics as a basis of genuine knowledge or faith in God. Diller does a fine job demonstrating how Plantinga can find apologetic/naturalistic arguments as beneficial to faith though never being the basis for faith (203-206). TED concludes with similar chapters on “Faith and Revelation” (chapter 8) and “Scripture and Theology” (chapter 9). Diller’s earlier effort to explain Barth and Plantinga profits a deeper discussion between the two men on the “sensus divinitatis” (258-260) and inerrancy of the Scripture (270-279). In conclusion, Theology’s Epistemological Dilemma is a phenomenal book for multiple reasons. It is a thorough introduction to the thought and work of both Karl Barth and Alvin Plantinga. It is a valuable look at how these two men compliment each other and can be used to combat modern opinions on knowledge of God, hermeneutics, and apologetics.